I worked most of the day yesterday organizing and finding a place for everything in my new studio space. I am feasting my eyes on this new creation as often as I can because a) I can’t believe that one of my dreams has finally come true and b) I don’t think it’s ever going to be this clean again. There’s even vacuum marks on the rug! The rug…..which is probably the one thing about the space I don’t like. I have visions of spilling a tray of beads and……..oh dear…….well, you can imagine the rest. Maybe someday we can install a ceramic floor or even a hardwood floor down here. The space in front of the heater on the far wall is where I want to put my metalworking table. I have a few options I’m looking at, including an offer to have a table made for me! 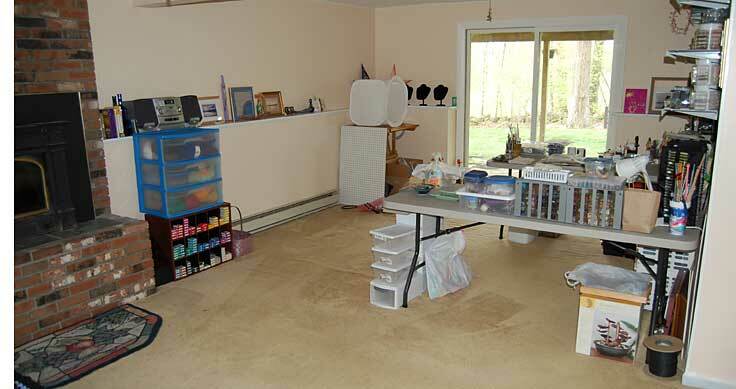 Here is the beadworking area. 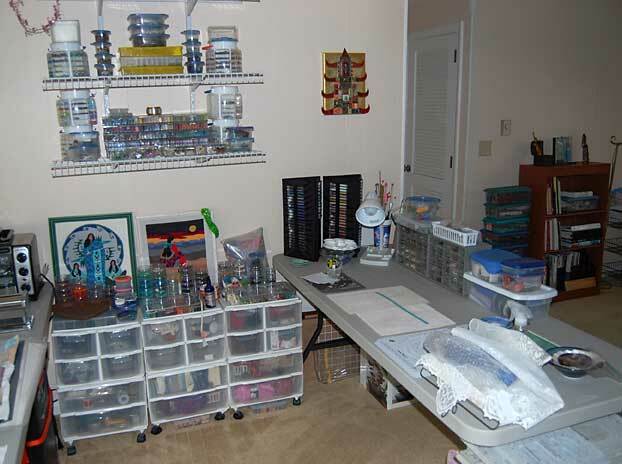 I was able to fit all of my beads on the shelves and portable storage units for easy access. 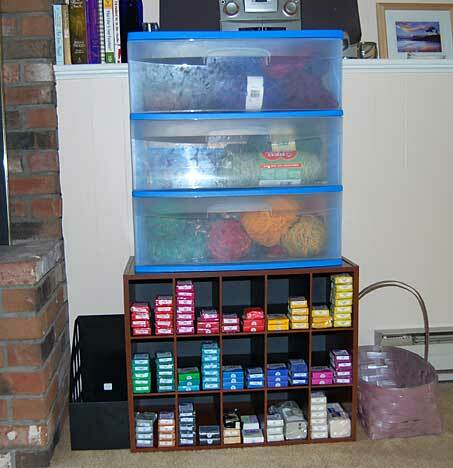 My good friend Amy, who has a fabulous studio BTW, told me about this nifty cube storage unit that’s perfect for organizing polymer clay. I just loved sorting the little squares by color and lining them all up in neat rows. Thank you, Amy! 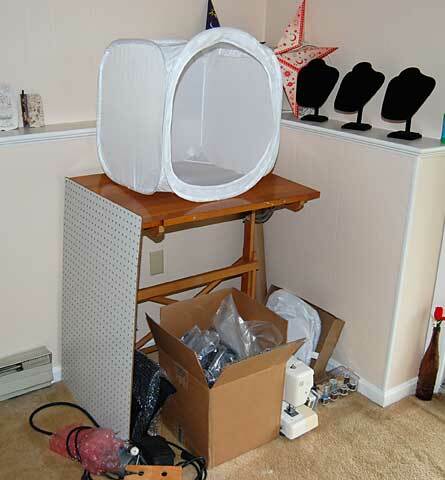 My light tent has found its home on a drafting desk in the corner. The box under the table contains the lights, waiting to be set up. The pegboard leaning against the left side of the table will eventually be screwed into the wall above the heater, I think. So, my tools will be hanging behind me. I’m not sure how that will work out but I’m going to try it out because I can’t place the table against the heater. My sewing machine is also waiting for a home somewhere in my studio. I have been very drawn to quilting books lately so it might come in handy for some future pieces. Here is the beading command center. My mosaicon hangs in a place of honor above my table. I enjoyed creating that piece so much! Resting on the portable storage units are a couple of beautiful Native American design needlepoint pieces created by my Mom. I store most of my seed beads in the Tic Tac style storage containers. They’re sorted by color and placed into clear rectangular storage units, fitting quite nicely together. I also have a lot of tubes that I store in a pen caddy. Each 3-sided unit is standing up on the table next to the wall. 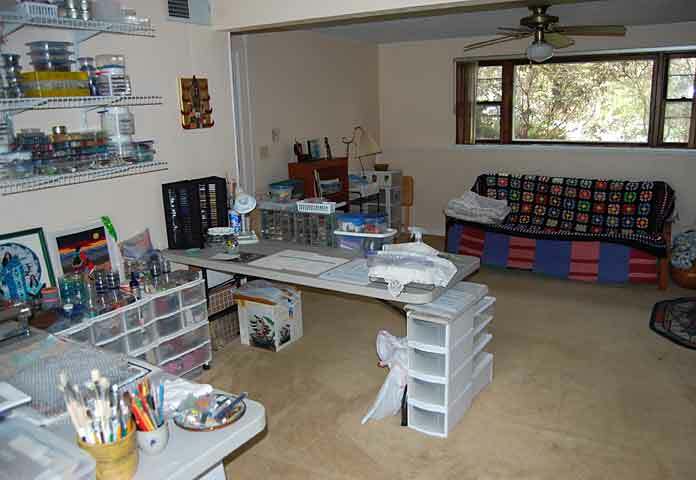 This entry was posted in Beads, Color, Creativity, Friends, Inspiration, Jewelry, My Studio, Polymer Clay, Uncategorized and tagged setting up an artist's studio. Yes, Karen! This is great. I can’t think of anyone more who deserves to have this.. Will you have a place for a cozy chair so you can read and have a cup of tea while a little green candle sitting in shell glows? ? and yes, Amy’s studio is ah, shall we say… amazing. Your new studio looks wonderful! I am envious of all your natural light. Everything looks so beautifully organized. One trick a friend used to protect carpet in her studio/guest room was to lay down an inexpensive piece of sheet vinyl flooring from Home Depot over the carpeting in the “messy” area. Another option is to get either one of the big plastic mats for rolling office chairs over carpet or a piece of indoor/outdoor carpeting. Girl, you rock! I’m so happy to see your studio come together. Your comment on ever having a clean carpet again made me laugh. I can tell you’re having fun putting your studio together. May you have many moments of creative inspiration. Your study looks great, I’m impressed with the way you organise your clay. It made me think I need to tidy that bit of my studio up! Can’t wait to see the designs that are the result of an inspirational studio! Thanks Judy for all of your inspiration and ideas regarding my studio space and your generous support during my moving process Yes, I want to put that comfy chair next to the bookcase and my little candle in shell glowing next to it. Put on the kettle and enjoy a nice cuppa tay…. Thanks Libby, awesome idea! I’ll pick up one of those sheets when I get my task chair. Thanks Kathi. I’m so glad that you were able to get some good ideas for the setup of your studio. Good luck and have a lot of fun! Yes Amy, this process has been and is continuing to be so much fun. Hard work but very satisfying and rewarding. 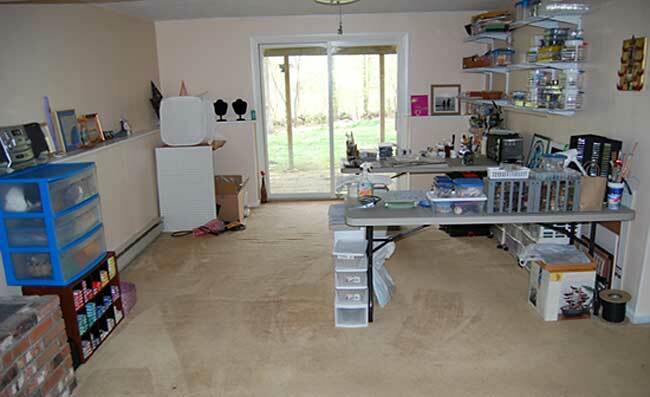 Well, at least I have a photo of what a clean and vacuumed studio looks like. lol Thank you so much for all of your wonderful inspiration and ideas! Thanks Kylee! Isn’t that a great little organizer? I love it. Just looking at the little blocks of clay lined up and sorted by color inspires me! I know, the carpet is a bit of a nightmare but the good part is that it”s old so if I mess it up, it’s not a problem. That being said, I really don’t want to have to be picking pieces of clay and beads out of it so I’m going to take Libby’s great suggestion and get a piece of plastic for the floor. Yes, the ideas are starting to flow already! Your pics make me want to run downstairs and organize and clean my area!!!! And I’m off to Target today to pick up the cubes! Thanks! I have carpet, too, and my next big project is to get rid of it. There’s so much clay in it and I try to be so careful. Thanks Susan! 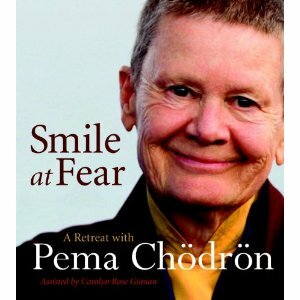 I’m glad to share and inspire. I visited your Flickr account and your work is simply gorgeous. Have fun with the cubes! Love your new studio, Karen !!! What a fabulous, roomy place ! I think you will enjoy countless hours of creativity in there ! As Susan mentioned above, it makes me want to organize my studio, which is a total disaster at the moment….When I go in there, I feel overwhelmed and tense, which is not especially conducive to being creative ! I like the storage unit for storing the clay…I am always on the lookout for better storage, although I suppose I ought to clean and purge first before I spend more $$ on storage ! Thanks Dora! I know, I’ll really enjoy this space. After going through the process of moving and being forced to purge a lot, I can feel how much energy it has freed up for me. I know that it’s challenging to get started with what feels like such an overwhelming task but once you get started, you feel it’s the best decision you made. Good luck with your cleaning and purging! Lookin’ good! How exciting! You have so much space to work with, you’re a lucky girl. My studio is way smaller, and though I love being here I would love to have more room like you! Hi Cindy, Yes, I’m so blessed to have this large room for my studio. I’m sorry I didn’t respond sooner to your comment but WordPress marked your comment as Spam, for some odd reason. Thanks!